Centrifugal pumps are a Dynamic type pump that operate on the principle of centrifugal force. Centrifugal force is a force that tends to move objects away from the center in a system undergoing circular motion. The casing on a centrifugal pump is designed to contain the fluid, form a volute, and hold internal and external parts together. Most are two pieces, bolted together, with a gasket in between. A radial split casing, is split perpendicular to the pump shaft, and an axial split casing is split parallel to the shaft. The volute is a gradually widening cavity inside the casing which serves as discharge to the pump. The inlet to the valve is commonly classified as the suction eye. Fluid enters from the center, and is sent outward to the volute by the impeller. In order to operate correctly, the inlet line must be primed (full of liquid). The impeller is a set of blades that rotate around the drive shaft, which spins and transfers the fluid from the center to the discharge. The driver can be either an electric motor or steam turbine. The shaft is what connects the driver to the impeller. The stuffing box, and packing gland hold the packing against the shaft and casing. This allows shaft movement through the casing while at the same time preventing leakage from the pump. If a pump is said to be horizontal, it means that the shaft is horizontal to the ground. Horizontal seems to be the most common in industry, however, vertical pumps are more compact, winterized better, and tend to have lower insulation cost. The most simple type of centrifugal pump, is a single stage pump. A single stage has only one impeller. In a multi-stage pump the fluid enters the suction eye of the first stage impeller, and is sent into the suction of the second stage propeller. There is an increase in pressure and flow at each stage until it reaches the discharge. 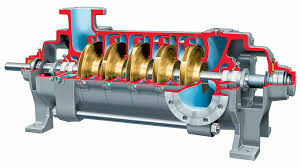 Most centrifugal pumps have just a single inlet. Some applications require a higher volume of pumping. In these circumstances, a pump with more than one suction can be used. Impellers come in three basic designs. An open impeller has vanes/blades are connected only to the shaft. It is self cleaning, but has very little structural support. A semi-open has a plate connected to one side for extra structural support. The vanes on a closed impeller are closed in between two plates for maximum support. This is the strongest, most common, and most efficient design, but is limited to use with clear liquids. Pressure head is a convenient term used in pumping, to describe the pressure required to force liquid in to a pump. In order to calculate the system, you will need to know the static head on both the suction and discharge side of the pump. In addition to static head, there are two more heads you will need to know in order to complete the calculation. The static head of a pump is the maximum height, or pressure, it can deliver. Static head is due to gravitational force on a column of fluid. The head cause by resistance in the piping, fittings, and valves, is called friction head. Surface pressure head is caused by any pressure that might be acting on the liquid in the tanks, including atmospheric pressure. The total suction head contains three separate heads. The equation of finding the total suction head is HSS+HPS-HFS=HS. The equation of finding the total discharge head is HSD+HPD+HFD=HD. To calculate the total system head subtract Hs from Hd. When cavities, or air pockets, form inside the fluid being pumped, it is called cavitation. Cavitation occurs on the suction side of the pump. There are five known causes of cavitation. The effects of cavitation are the cavities or bubbles will collapse when they pass into the higher regions of pressure, causing noise, vibration, and damage to many of the components. Loss in capacity, the pump can longer build the same pressure, and the pump’s efficiency dropping are effects as well. Rapid swings in the discharge pressure are one way to recognize cavitation. Another way to recognize cavitation is by sound. Cavitating pumps resemble the noise of steel ball bearings being introduced into the pump. 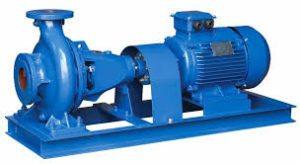 A cavitating pump must be resolved quickly in order to avoid severe damage. Some advantages to centrifugal pumps are that they cost less and less maintenance and space are required. Also, centrifugal pumps will with a constant head pressure over a wide capacity range. Finally, the variety of drivers make for a good advantage. Centrifugal pumps do have their disadvantages however. They are not self priming and respond very poorly to viscous materials in suction pressures.